A river is a natural waterway that conveys water derived from precipitation from higher ground to lower levels. Most commonly, rivers flow on the surface of the land, but there are also many examples of underground rivers, where the flow is contained within chambers, caves, or caverns. In some areas where the rainfall is highly variable, the rivers may carry water only occasionally, remaining dry for years at a time. Rivers sculpt the continents. Many early civilizations began near the banks of rivers. A river may have its source in a spring, lake, from damp, boggy places where the soil is waterlogged, from glacial meltwater, or simply from rain flowing off impermeable rock or man-made surfaces. Almost all rivers are joined by other rivers and streams termed tributaries, the highest of which are known as headwaters. Water may also be recruited to a river from groundwater sources. Throughout the course of the river, the total volume transported downstream will often be a combination of the free water flow together with a substantial contribution flowing through subsurface rocks and gravels that underlie the river and its floodplain. For many rivers in large valleys, this unseen component of flow may greatly exceed the visible flow. From their source, all rivers flow downhill, typically terminating in the sea or in a lake. In arid areas rivers sometimes end by losing water to evaporation. River flow may also be lost by percolation into dry, porous material such as sand, soil, or into pervious rock. Excessive abstraction of water for use in industry, irrigation etc can also cause a river to dry before reaching a lake or the sea. The mouth, or lower end, of a river is known by hydrologists as its base level. The area drained by a river and its tributaries is called catchment, catchment basin, drainage basin or watershed. The term "watershed" is also used to mean a boundary between catchments, which is also called a water divide. A river's water is generally confined to a channel, made up of a stream bed between banks. In larger rivers there is also a wider floodplain shaped by floodwaters overtopping the channel. Floodplains may be very wide in relation to the size of the river channel. This distinction between river channel and floodplain can be blurred especially in urban areas where the floodplain of a river channel can become greatly developed by housing and industry. 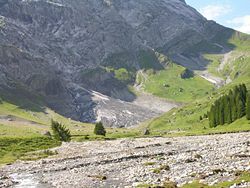 The river channel itself may contain a single stream of water but many rivers, if left unconstrained by human activity, will create several streams of water within a channel producing a braided river. Braided rivers can still be commonly seen in South Island New Zealand and on some of the larger river deltas. A river flowing in its channel is a source of considerable energy which acts on the river channel to change its shape and form. 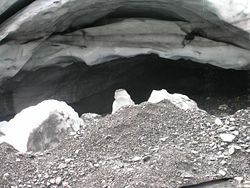 In mountainous torrential zones, this can be seen in the form of erosion channels through hard rocks and the creation of sands and gravels from the destruction of larger rocks. In U-shaped glaciated valleys, the subsequent river valley can often easily be identified by the V-shaped channel that it has carved. In the middle reaches, where the river may flow over flatter land, loops (meanders) may form through eroding of the river banks and deposition on the inside of bends. Sometimes the river will cut off a loop, shortening the channel and forming an oxbow lake. Rivers that carry large amounts of sediment may develop conspicuous deltas at their mouths, if conditions permit. Rivers, whose mouths are in saline tidal waters, may form estuaries. River mouths may also be fjords or rias. Although the following classes are a useful simplified way to visualize rivers, it is important to recognize there are other factors at work here. Gradient is controlled largely by tectonics, but discharge is controlled largely by climate and sediment load is controlled by various factors including climate, geology in the headwaters, and the stream gradient. Youthful river - a river with a steep gradient that has very few tributaries and flows quickly. Its channels erode deeper rather than wider. Examples include the Brazos River, Trinity River and Ebro River. Mature river - a river with a gradient that is less steep than those of youthful rivers and flows more slowly than youthful rivers. A mature river is fed by many tributaries and has more discharge than a youthful river. Its channels erode wider rather than deeper. Mature rivers are typified by the Mississippi River, Ohio River, and England’s Thames River. Old river - a river with a low gradient and low erosive energy. Old rivers are characterized by flood plains. Examples of old rivers include the Tigris River, Euphrates River in the Middle East and the Indus River. Rejuvenated river - a river with a gradient that is raised by tectonic uplift. Flooding is a natural part of a river's cycles. The majority of the erosion of river channels and the erosion and deposition on the associated floodplains occur during flood stage. Human activity, however, has upset the natural way flooding occurs by walling off rivers, straightening their courses and by draining of natural wetlands. 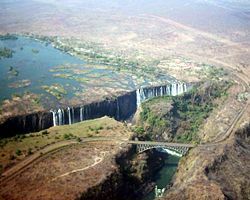 The flora and fauna of rivers have developed to utilize the very wide range of aquatic habitats available, from torrential waterfalls to lowland mires. 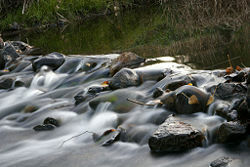 Although many organisms restrict themselves to the freshwater of rivers, some, such as salmon, spend different stages of their lives in rivers and the sea. Rivers have been useful for human existence since the dawn of civilization. They have served as sources of water and food, means of transport, lines of defense, sources of electric power to drive machinery, and waste disposal sites. Even today, many major cities are situated near rivers. In addition, rocks and gravel generated and moved by rivers have been useful for construction projects. In recent generations, the beauty of rivers and their surrounding habitat has contributed greatly to local economies by attracting income from tourism. In upland rivers, one often observes waterfalls and whitewater rapids. Waterfalls are sometimes used as sources of energy, by way of watermills and hydroelectric plants, and rapids are often used for recreational purposes. Rivers are often managed or controlled to make them more useful and less disruptive to human activity. Dams (see above) or weirs may be built to control the flow, store water, or extract energy. Levees may be built to prevent run-off of excess river water in times of flood. River management is an ongoing activity, as rivers tend to 'undo' the modifications made by man. Dredged channels silt up, sluice mechanisms deteriorate with age, levees and dams may suffer seepage or catastrophic failure. The benefits sought through managing rivers may often be offset by the social and economic costs of mitigating the effects of such management. For example, in many parts of the developed world, rivers have been confined to channels to free up flat flood-plain land for development. Subsequent extreme flooding events can inundate such development at high financial costs and often with loss of life. Rivers have been important historically in determining political boundaries. For example, the Danube was a longstanding border of the Roman Empire, and today forms most of the border between Bulgaria and Romania. The Mississippi in North America, and the Rhine in Europe, are major east-west boundaries in those continents. The Orange River forms the boundary between various provinces and countries along its route in Africa. A misconception, particularly amongst schoolchildren and college students in North America, is that most—or even all—rivers flow from north to south. Rivers in fact flow downhill irrespective of direction and is often a complex meandering path involving all directions of the compass. The Dnieper River, one of the main rivers of Russia, Belarus and Ukraine. The James River. the principal river of Virginia in the USA, historically important. International Scale of River Difficulty - The scale is used to rate the challenges of navigation—particularly those with rapids. Class I is the easiest and Class VI is the hardest. Strahler Stream Order - a method to rank rivers based on the connectivity and hierarchy of contributing tributaries. Headwaters are considered first order, while the Amazon River is twelfth order. Approximately 80 percent of the rivers and streams on Earth are of the first and second order. ↑ Bill Weiler, Operation Physics: Children's Misconceptions about Science, American Institute of Physics (September 1998). Retrieved July 31, 2017. ↑ William C. Philips, Earth Science Misconceptions. Retrieved July 31, 2017. ↑ Matt Rosenberg, “Rivers Flowing North,” ThoughtCo. Retrieved July 31, 2017. ↑ Nezette Rydell, Re: What determines the direction of river flow? Elevation, Topography, Gravity?? MadSci Network: Earth Sciences, Washington University Medical School. Retrieved July 31, 2017. ↑ Cristi Cave, How a River Flows, Stream Biology and Ecology. Retrieved July 31, 2017. Wolf, Aaron T. et al. "International River Basins of the World." International Journal of Water Resources Development 15(4) (Dec. 1999). Retrieved July 31, 2017. This page was last modified on 31 July 2017, at 16:09.